On Wednesday, when I joined on the 4x4-drive along the island, I had my last night at the Stradbroke Island Hotel. And that was all they offered me, two nights in their hotel. From the hotel I moved on to the Straddie Guesthouse, owned and run by Trevor and Wendy. 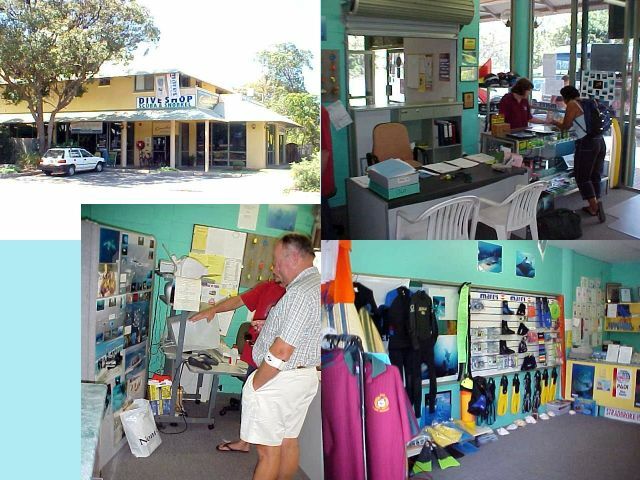 The guesthouse is one of their two businesses; the other one is the Stradbroke Island Scuba Centre. On Thursday morning I was immediately offered to go along with sandboarding. And that�s an experience, the driver Barry (another Barry), took the group of backpackers and me up the dunes, gave us the boards and gave an example of going down. Sandboarden isn�t probably that different than snowboarding. You don�t get wet after falling off the board, but you do turn into a sandman if you fall down (and tumble all the way down). One French guy thought it would be like snowboarding and immediately started to make a jump halfway the dune. It didn�t take him long to figure out that landing on snow is different than landing on sand, which will just be like concrete. It was a fun experience; the only little thing of disappointment was the fact that you always have to walk up the entire dune to get started again. Bummer, haha. I have been sent to Stradbroke to relaxed and really soaked up the sun as long as it was possible, so that�s exactly what I have been doing the last few days. Wendy and Trevor thought it would be the best thing do just let me do what I wanted to do, without bothering or programming my day too much. And that was very nice of them. I could sleep in, do some gorge walks at the rocks, do some sunbathing, play some pool, watch television and whatever you can do on the area of the guesthouse. My hosts had even arranged a AU$ 25 gift-voucher from the local supermarket, so I could get myself some groceries and make myself breakfast and dinners in the night. And I slowly emerged with the other backpackers, while conversations were going on all the time and people had some inspiring discussions with each other. I shared a four-bed dorm with the old German Peter. He must have been in his sixties, but he has been visiting Stradbroke for ten years now, and every time he stays four weeks. Back home in Germany he works at the University of Bonn as a technical scientist. I have promised to visit him, when I ever pass this former capital of former-West-Germany. The other roommate was the Norwegian traveller Harald from Bergen, who actually remembered reading about me in the Bergens Tidene (Bergen Times) when I visited his hometown. The fourth night at the guesthouse, Wendy and Trevor had invited me at a barbecue. They live just 200 metres away from the guesthouse. Trevor made an open fire in their garden and we had some great steaks from the plate. Trevor used to work for an electrical company in the Northern Territory and while doing that he wasn�t always home that often. So to change their lives, the couple decided to take over the hostel on Stradbroke Island and just share their lives more together � and that was some five years ago. Hopefully their kids will take over the hostel when they grow older. This weekend was also the weekend when the news was on TV and in the newspapers about the British backpacker Caroline Ann Stuttle that was murdered in Bundaberg (200km up north) on Thursday. The lady went for a walk to the other side of town towards a phone cell, pretty late at night also. The next morning her body was found in the park below the bridge. The news says: �It�s believed that she is robbed and thrown over the bridge.� Unfortunately this incident becomes international headline news, because it is about another backpacker. Immediately the media takes out all the files of previous cases concerning backpackers and suddenly everybody lays their fears on us. Some of the guests called home, to get their family and friends at ease. Most of us were asking the question why that lady would walk in the dark at 11pm at night, all by herself. You shouldn�t do that, not in Bundaberg, just like in London or Paris.